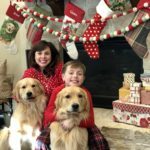 My goodness I love the Christmas season and the magic and spirit that surround it. I love the festive touches that are everywhere you go because wreaths, garland, and twinkle lights just make everything better. I love the Christmas music. I love the spirit of giving that everybody seems to have. I love getting to see family and friends. I love shopping for our angel from the angel tree as a family. I love the food, my goodness I love the food. 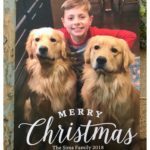 I love getting Christmas cards. I love giving presents to my loved ones, and if I’m honest, I love receiving them too! I especially love the excitement that surrounds Christmas morning and getting to see my people open their presents. Most of all I love the Christmas Eve service at church and spending that time as a family reflecting on the real reason for Christmas. 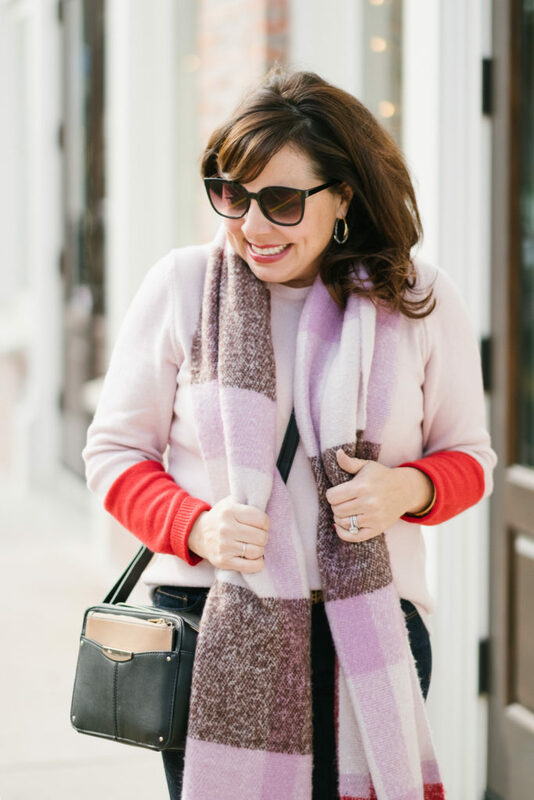 I also love getting dressed for all of the holiday events, and Ann Taylor has us covered! 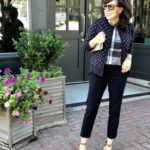 I’m working with Ann Taylor and Shopstyle today, and I’m bringing you 5 great looks! The first 3 looks are all great for running around town and casual get togethers with family and friends during this wonderful season. The last 2 looks are ones I put together that would be great for dressier events….like a formal company Christmas party, an adult evening out, a holiday charity ball, or even New Year’s Eve. And get this. ALL FULL PRICE MERCHANDISE is 40% OFF right now with the code FLASHSALE! TODAY ONLY. 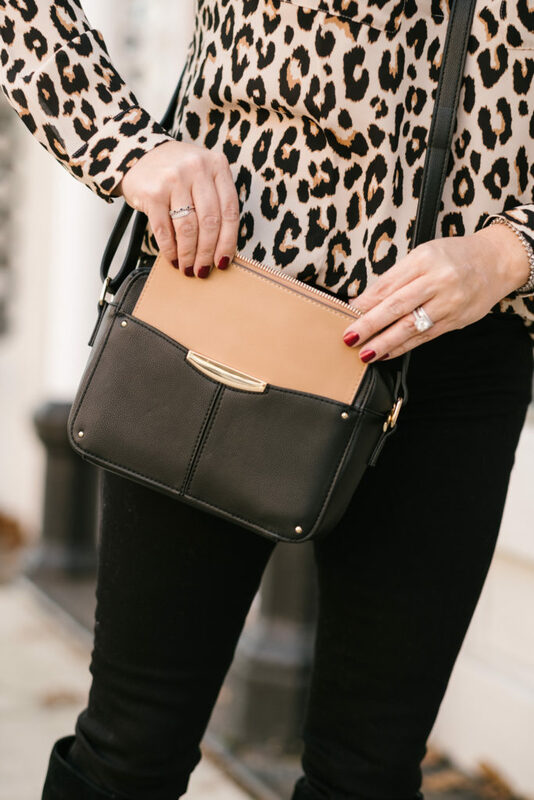 If you’ve been reading my blog for any length of time, you know I love a great leopard piece. 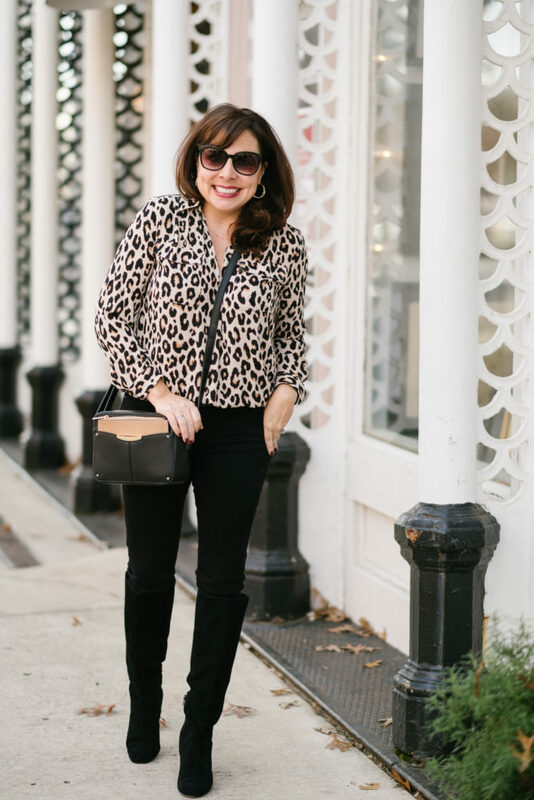 I love leopard shoes, leopard bags, and I really love a leopard top. 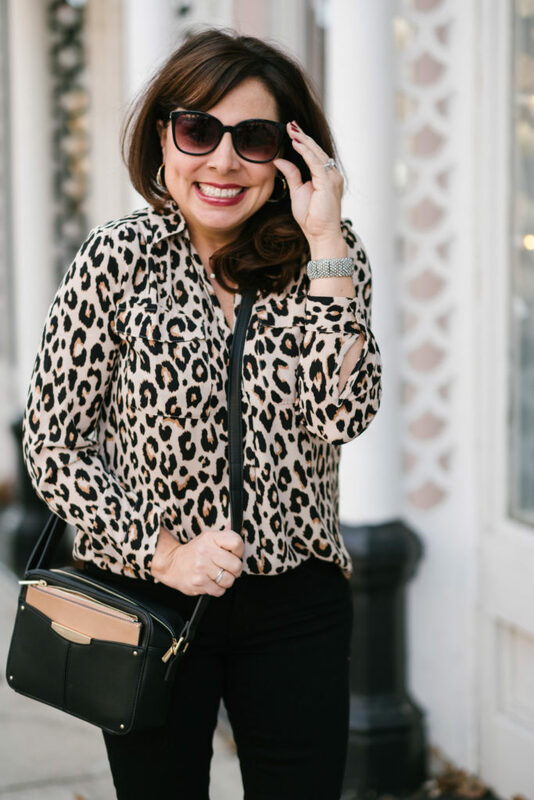 I featured one awhile ago that sold out immediately, so I was thrilled to find this one (which I like even more than the original blouse I featured). I highly recommend this blouse. I think it’s totally chic and timeless. The leopard print is gorgeous. 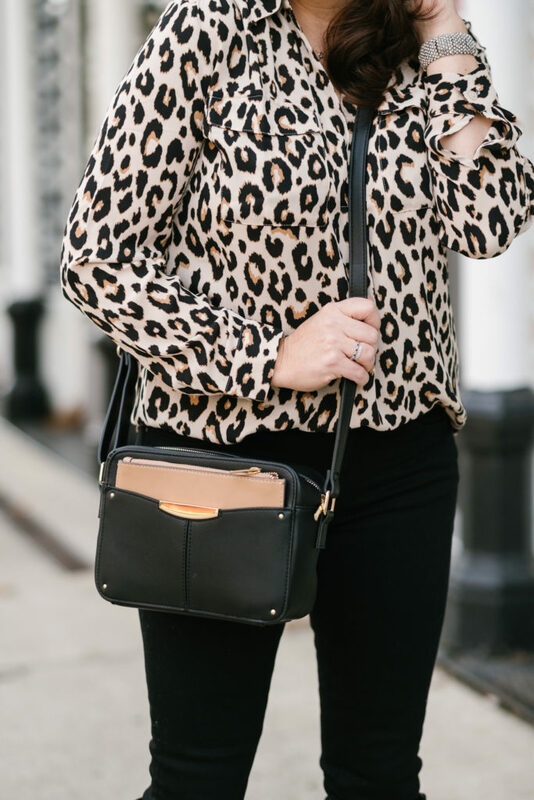 I think of leopard as a neutral when it’s on an accessory, but when it’s on a blouse, I think it makes a really bold statement. I also love the cut of this blouse. It’s a relaxed fit, so it would look great worn out with a really skinny pant. It also looks great with a half tuck, which I’ve done here. For size reference, I’m wearing a small in the blouse. The boots are stylish and comfortable and can be worn with jeans, leggings, and dresses. I’m wearing them with all 3 of my outfits in today’s post. Did you know that Ann Taylor carries an amazing selection of flats, heels, boots, and booties? They are often quite special with some type of embellishment, texture, pattern, or interesting heel. 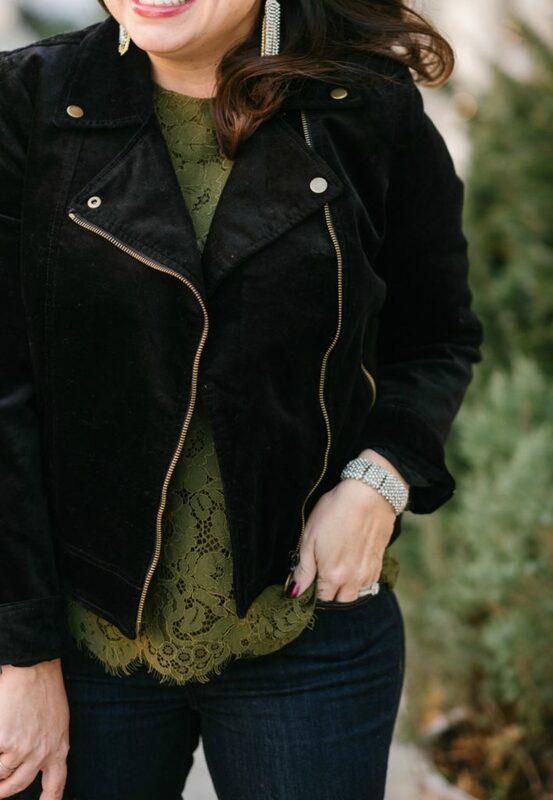 I liked wearing the blouse casually here with black jeans, but it could be easily dressed up with velvet pants, suit pants, or a pencil skirt and heels. Layering it under a blazer is another great option. The jeans are so comfy and flattering. I’m wearing a 4R, but their petite jeans are better on me (to prevent bunching at the knees). They only had the regular size in store, so I went ahead and grabbed them for the post. Some reviewers mention a chemical smell, but they must have fixed that issue, because mine don’t have an odor at all. The bag is a great basic. 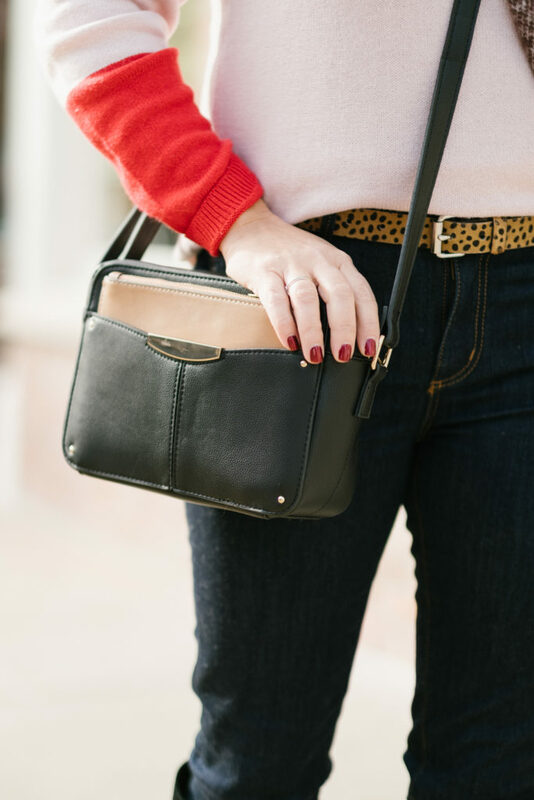 It has an adjustable strap, so it can be altered to be worn cross body or over the shoulder. I chose the black and cognac color combination, but it also comes in a grey and taupe color combo. If you prefer a larger bag, it comes in these sizes as well. It has two interior pockets, and plenty of room inside for keys, make up essentials, and a cell phone. It also has this great exterior pouch that can house essentials that need to be reached easily on a night out, like your license or a credit card. 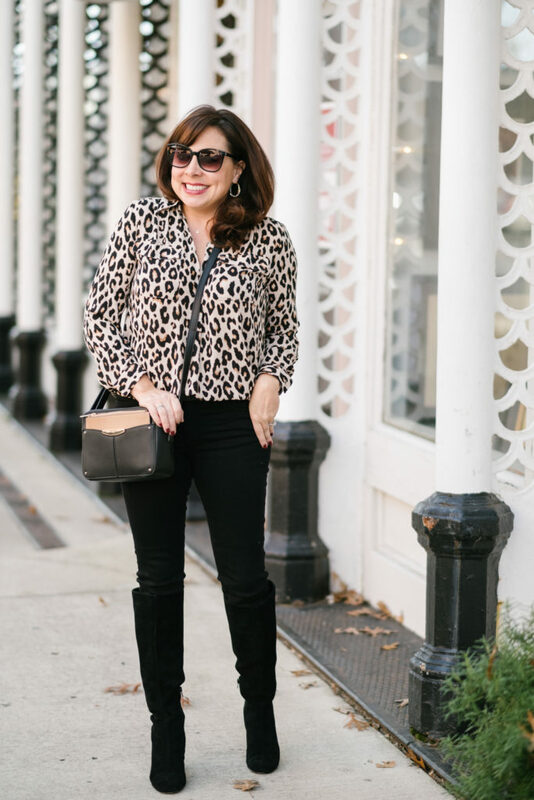 You’ll see more of this moto jacket in a minute, but I loved it paired with the leopard here as well. 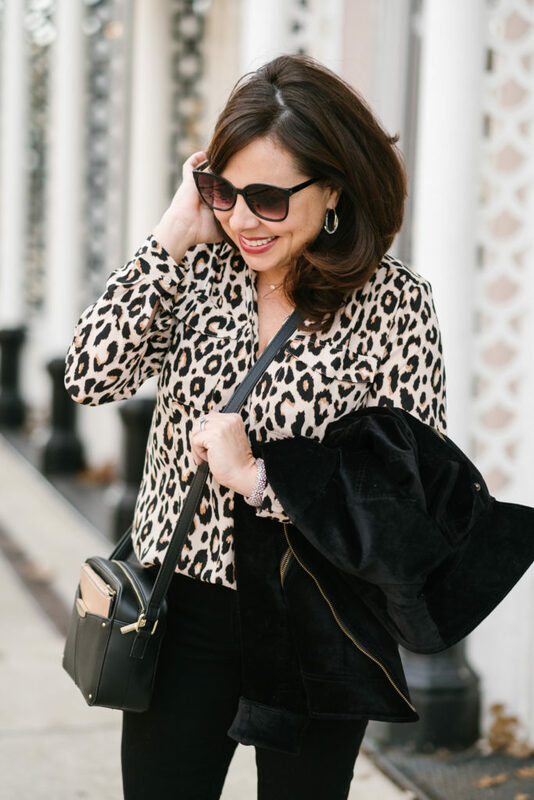 Ann Taylor does leopard really well, so here are some other leopard pieces that I love! I think pink and red look great together all the time, but I especially love it around Christmas. It’s just a happy color combination! 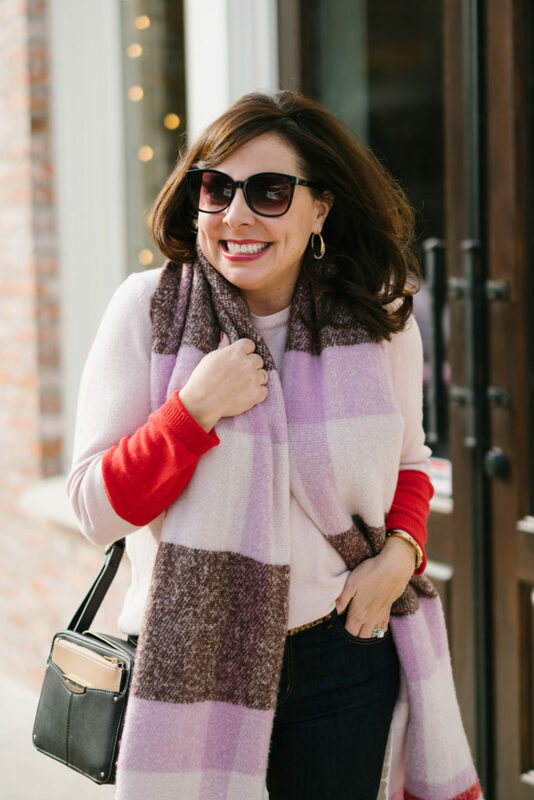 This color block sleeve sweater is festive on it’s own, but the addition of the plaid scarf makes the outfit (and me!) all sorts of merry. The sweater also comes in a white/grey and a wine/navy combination. I sized up to a medium in the sweater. These jeans can of course be worn casually, but the dark wash really lends itself to being able to dress them up as well, which you’ll see with the next outfit. The site describes them as having “maximum stretch” and “good recovery”, which is just a fancy way of saying they don’t sag! They have great reviews, and many reviewers talk of buying multiple pairs in different washes. 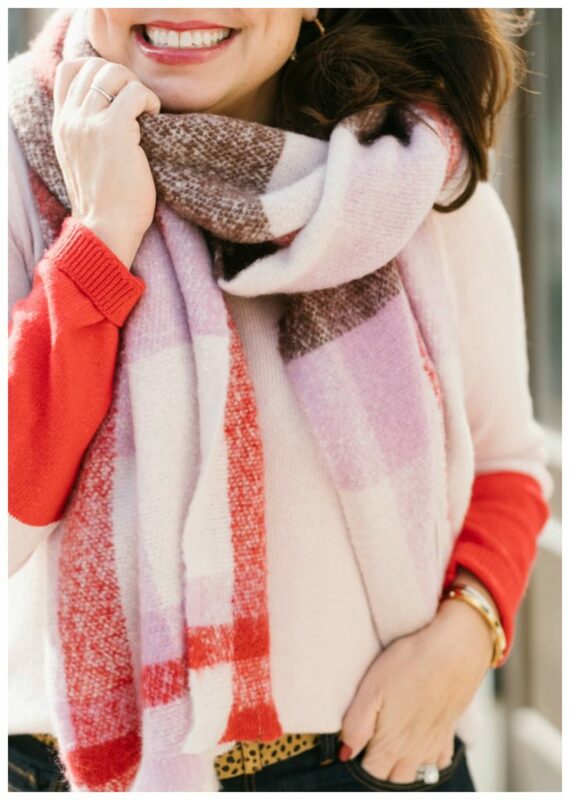 This scarf is thick and chunky, but it can still be worn wrapped around the neck as well. I think it’s extra cute and cozy this way. 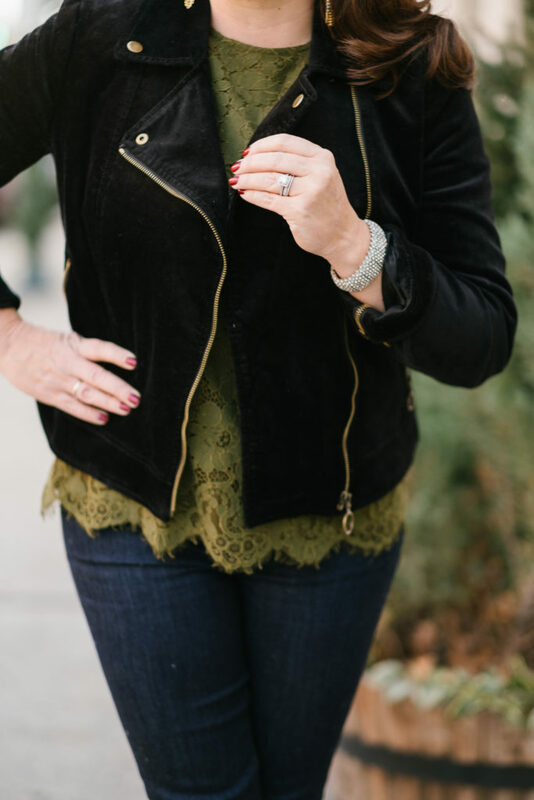 Green lace and a black velvet moto jacket have me feeling pretty fancy in this next outfit, even though I’m just wearing jeans. 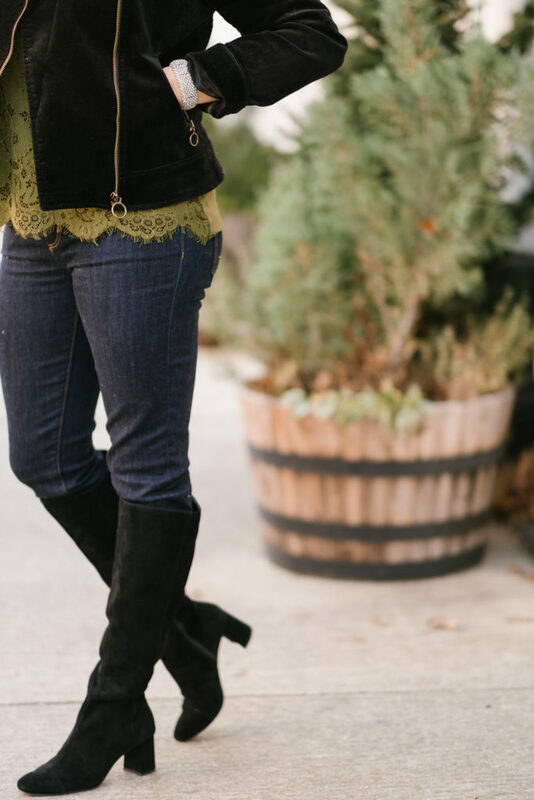 Lace and velvet can elevate a look and make you party ready in no time. And a little bling doesn’t hurt. 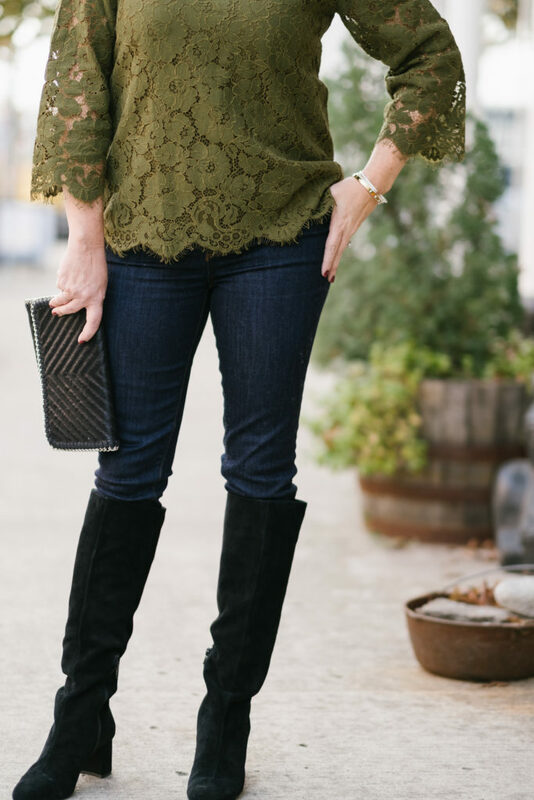 Look how pretty this lace top is! It’s elegant, classic, and would make a wonderful addition to any closet. The front and sleeves are all lace. The bodice is lined, but the sleeves are not, which is a lovely touch. The lace also boasts a pretty scalloped edge on the sleeve as well as hem. I was drawn to this rich green, but it also comes in black. The moto jacket was perfect layered over it. This jacket only has 6 reviews on the site, but all 6 are 5 stars and it’s easy to see why. I fell in love with this jacket, the cut of it, and the gold hardware the second I laid eyes on it in store. 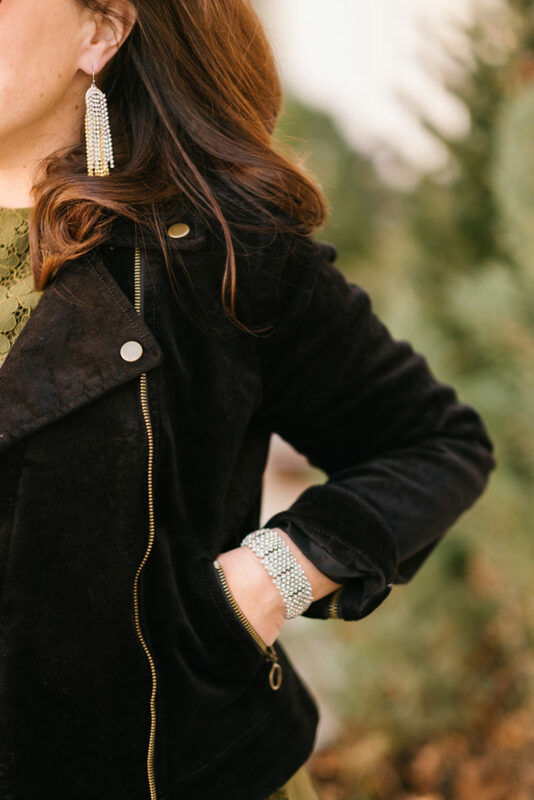 The velvet is beautiful, it looks much more expensive than it actually is, and it’s a piece that you will have in your closet for a long time. It will work with jeans, as well as nicer slacks and dresses. It will add a load of style to all different sorts of outfits. The gold hardware really stands out and gives it a bit of an edgy look. I always size up in jackets and it’s not uncommon for me to wear an 8 in pieces like this, but the 8 that I’m wearing here was too big on me. A size 6 would have worked much better, but they were almost sold out in store of all sizes, and I wasn’t able to squeeze into the 2. I still grabbed it because I knew I had to feature it. So many of you are going to love this jacket. And let’s not forget about the boots. They were in all 3 outfits today, so you can see they are quite versatile! True to size for me and comfortable. Although not personally wearing them, I have two additional outfits I want to share with you today. 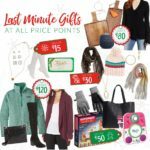 Ann Taylor has so many great pieces right now, I just had to share a couple more ideas! If you’ve got a formal event coming up, check out this gorgeous sequin dress! I kept everything pretty simple with shoes and accessories, but I think it’s such an elegant look. And I love the bow detailing on the shoes and earrings. And doesn’t this outfit have you feeling like heading to the Christmas Eve service at church and then caroling through the streets afterwards? It has me in the Christmas mood for sure! So do you have any fun plans this holiday season? Do you need just casual outfits that are a little bit special? Or do you need full blown fancy outfits where you are decked out from head to toe? 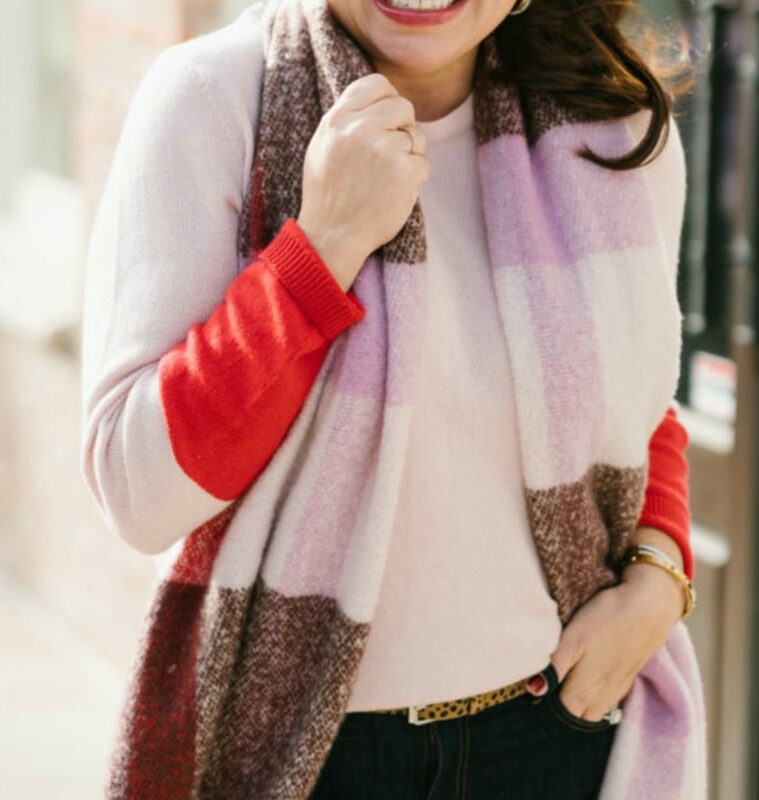 Don’t forget about Ann Taylor as a source to get you out the door and looking and feeling festive for all of your holiday events! 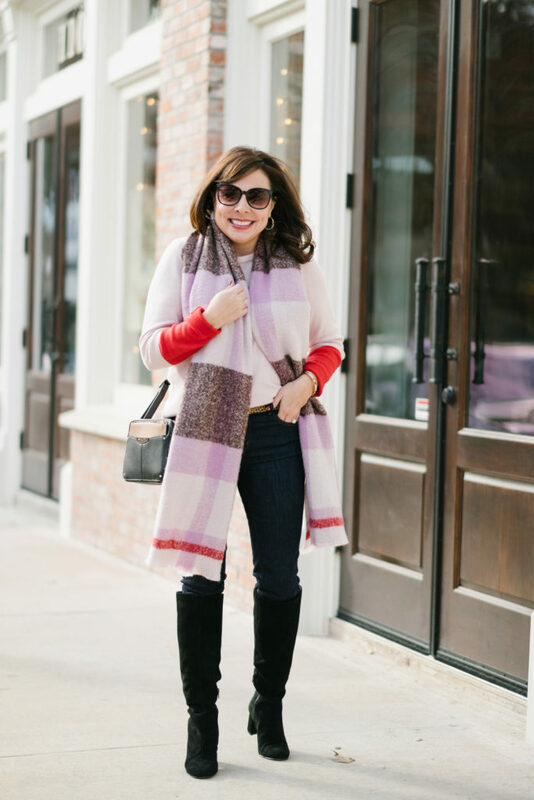 Thank you to Ann Taylor and Shopstyle for sponsoring this post, and don’t forget that everything you saw on today’s post is 40% OFF! Photos by the super talented Stephanie Drenka. 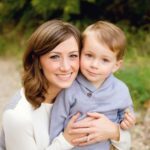 Conner’s Closet: WORK WEAR GUIDE #10 (40-50% OFF)!!! 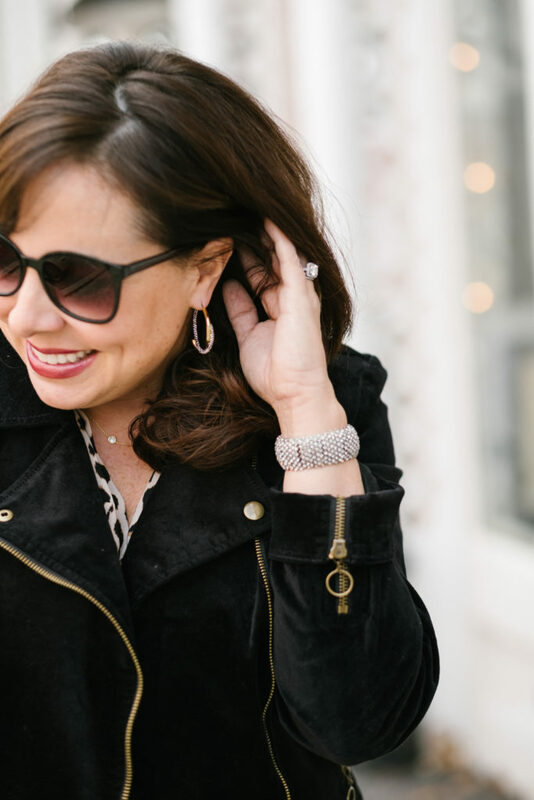 You’re rocking all those festive looks, Mama! Hi Sheaffer, Feeling the ❤️ for the “I love…” section at the beginning of your post this morning. What a good reminder to embrace what we love about the season. Oh yes, and you can also sign me up for that cute little “Camera” bag. I am obsessed with that black jacket! That piece will work with everything! 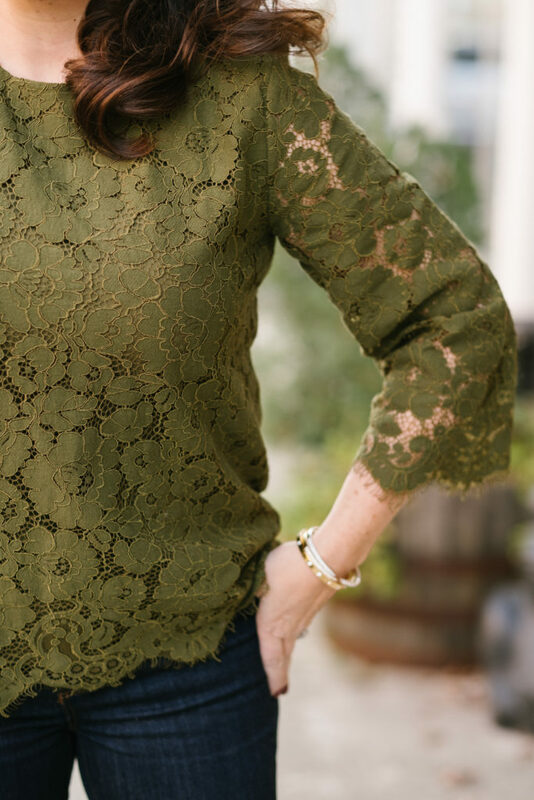 Oh, I love that green lace top! How gorgeous!! Oh my! That outfit with the black lace top and red pants!! I’m hoping they have a similar pant in another fit as I’m not sure the curvy fit will be perfect for me. Yay!! I love how you styled all these looks! Really wishing I could have photographed you in that black sparkly dress, though hehe– I bet it would look gorgeous! I took one look at the green lace top, put my computer down without finishing checking my email, and drove myself to a nearby town and got it. I LOVE IT! Thanks so much! You totally rock all those look! LOVE LOVE LOVE the black boots as well!